This album was born from the intention of making an album the way one writes a book, where every song would represent a chapter, all about the birth, life and death of a female character from whom we ignore the name and observe the twisted path. The concept strangely came to me, as I was going through an old toybox in my little brother’s bedroom. Not looking for anything in particular, I found inspiration, coming up the ripped cover of a children’s book, where one could see a young girl sitting alone in a field. The title read:, »She was all alone in her head ». The sadness and the sobriety of the landscape, as well as the intriguing formula entitling the image were enough to embark myself in a journey to make up the sounds and stories of this girl. It was all invented when on a trip in the english countryside around Birmingham in the month of July 2006. The first recording sessions took place in my friend Eliot’s apartment, when isolated from all, in the empty summer heat, I was taking my first solitary trip in producing my second musical effort. Other sessions were completed in my maternal home, in the pleasant company of Julien Rocchia who helped a lot to make sure it sounded good. The most vivid memory from that album was the blitzkrieg-recording of the song « love is like the rain », from which the lyrics sprung very fast onto the sheet of paper. Recorded pretty much as soon as it got written, during a extremely hot night of insomnia, with all windows wide opened and a naked and sweaty body. We can find developed in that short and somber album the childhood theme evoked in the first album, this time with a more despairing tone, and stretched to the teen age and the suburban blues. 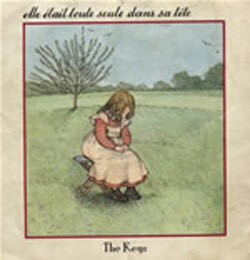 The introduction to this musical story was freely inspired by the wonderful movie “Toto le héros” by Jaco Von Dormael.